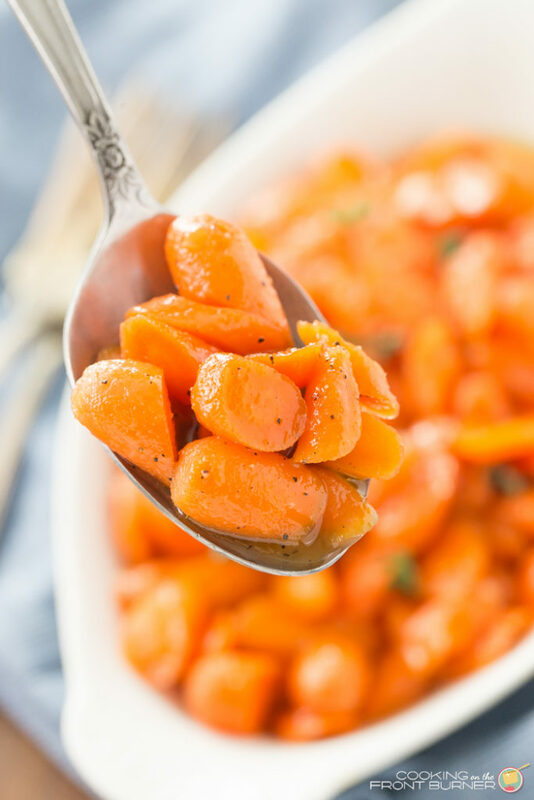 Bourbon honey glazed carrots are easy to make and add a pop of color to this great side dish! You will love the honey glaze too! 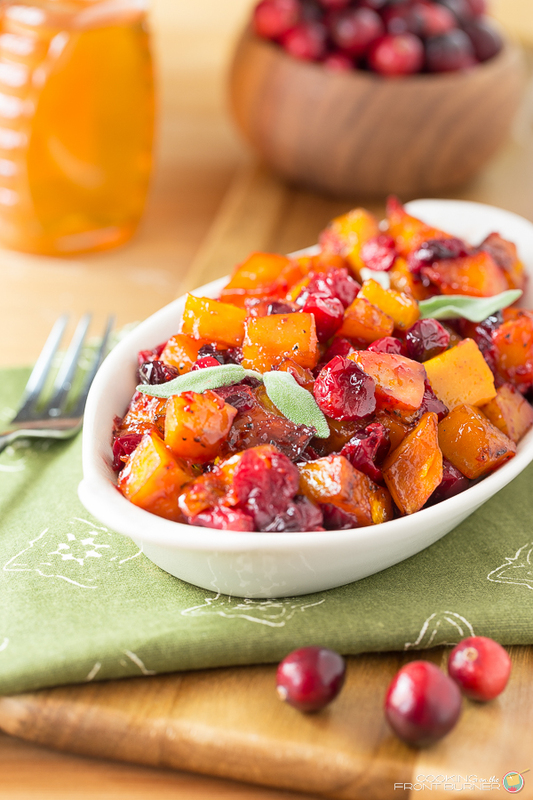 Move over other veggies, there’s a new side dish in town that packs a punch and is perfect for the upcoming holidays. 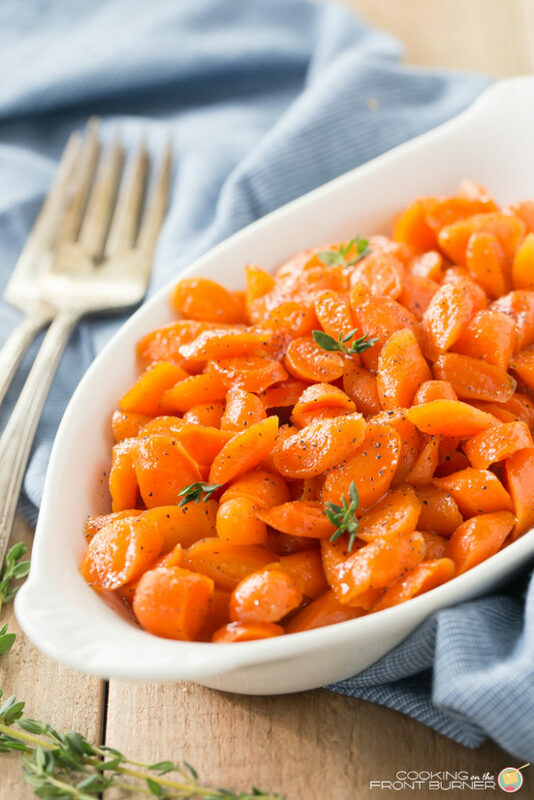 These Bourbon Honey Glazed Carrots are exactly what you need to dress up the table for your feasts. 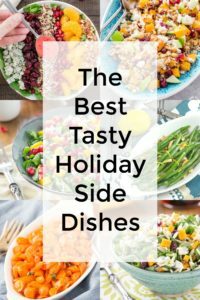 I think one of the best things about the holidays is having a table full of different side dishes to try. 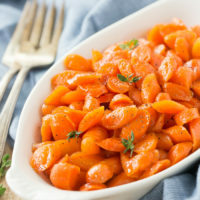 I love my mashed potatoes, stuffing, cranberries, green bean casserole and now I have these tasty carrots to make room for on my plate. I might need a bigger plate though. But what the heck, that’s what the holidays are all about good eats. 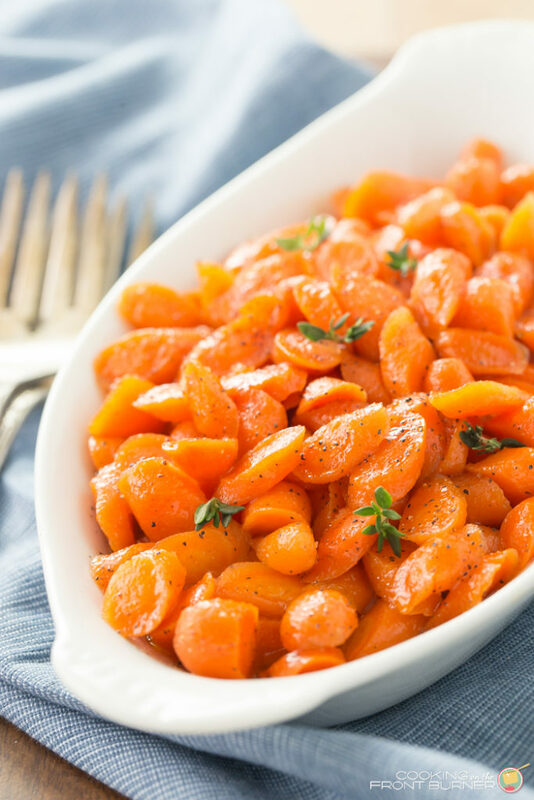 Glazed carrots add a pop of color and provide a nice touch of sweetness. 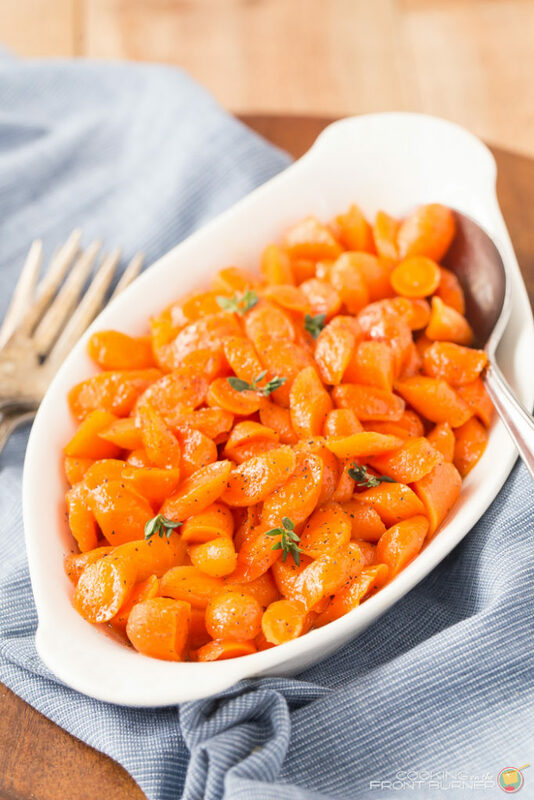 Even better is that this dish comes together in under 20 minutes (maybe 15 if your carrots are already peeled!). Also, carrots are supposed to be good for your eyes, right? And you will need that extra vitamin A and beta carotene when you tackle those black Friday ads. How do you spend your Thanksgiving holiday? We typically go to my daughters about 90 minutes away – we’ll arrive on Wednesday night and then help with the prep on Thursday. Someone will run out and get the paper (and even sometimes we weigh it -us dorks!). After the meal which is usually early afternoon, we clean up, relax, have the dessert later then we all start going through the ads. I’m not much of a black Friday shopper, but I do get some ideas from the ads and then I usually request everyone’s list by the end of that weekend. I like to get my shopping done early if I can. 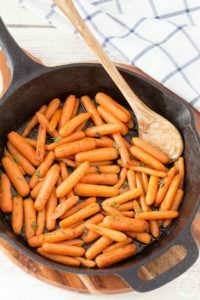 You’ll also love that these bourbon honey glazed carrots can be made in advance, then warmed up when it’s time to eat. Not a fan of bourbon? Then you could leave it out and use a bit of maple syrup instead. Those would be super yummy too! Those carrots look fantastic! I was literally drooling while going through this post! Oh my gosh, the Thanksgiving paper is always HUGE!! I don't do Black Friday shopping, but I love checking out the ads, too! These carrots need to be on our Thanksgiving table this year! What a treat for the holidays! So much deliciousness! I could eat this whole dish, Deb — I love the bourbon in these! My family would absolutely love these! They look amazing! This looks so good! 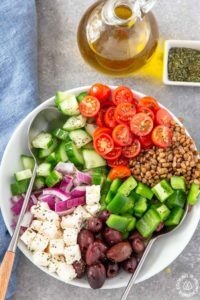 I'm always looking for new ways to add veggies to my life! Thanks for posting it on the our mini Linky party for me to find! 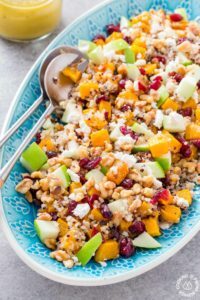 We're still figuring out our Thanksgiving plans but, this is a great dish to bring wherever we end up 😉 Thanks for sharing with us at Funtastic Friday! 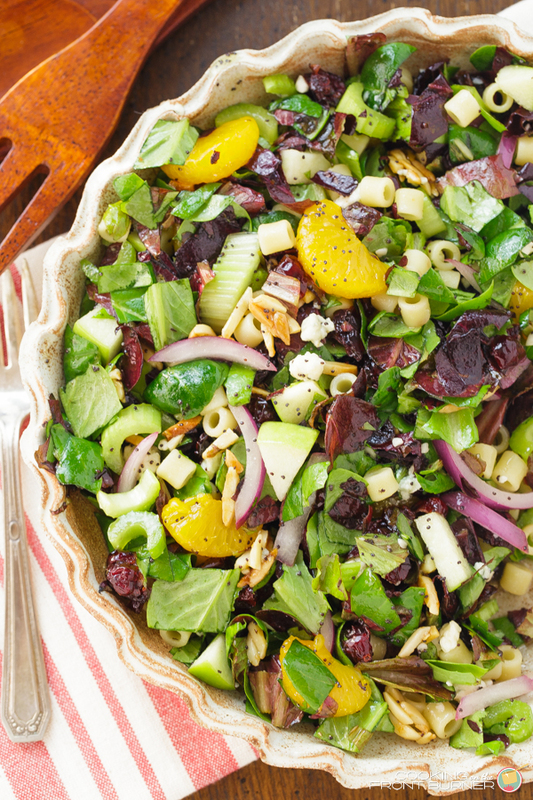 Gorgeous photos of a delicious dish! Seriously, I wish I could just reach through the computer screen with a fork. Thanks so much for sharing this at my Creative Ways Link Party last week! You'll be one of the features at tomorrow night's party!